A local security official told The Express Tribune that security officials, including officials from the Khasadar forces, stopped a car at the Landi Kotal check-post early on Friday morning for routine checking. In the car, Afghan national Ala Ali said that he was heading to Afghanistan. There were several briefcases in the back of his car. Suspecting that the baggage looked too heavy, the security officials asked him to open it up for inspection. Ali, however, allegedly tried to bribe the security personnel at the check post in a bid to skip the search. But when the security forces insisted and opened the bags, they found several Mughal-era antiques inside. Ali was subsequently arrested for smuggling. Later the Assistant Political Agent of Landi Kotal Niaz Muhammad displayed the recovered items before the media. 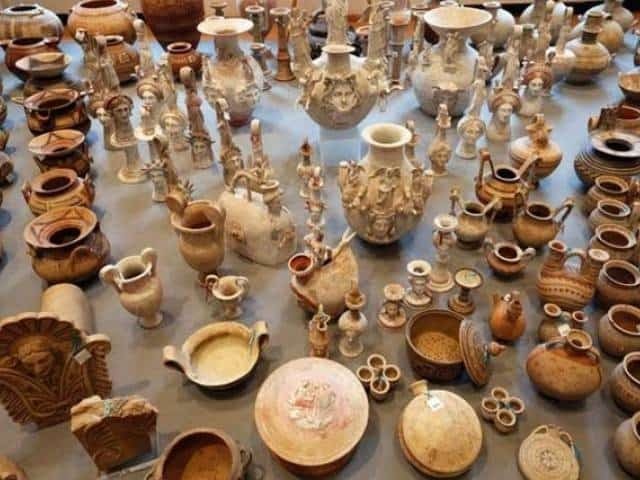 He said that these antiquities are smuggled into Afghanistan before being smuggled into the European Union where they are sold on the black market. He asked the archaeology department to inspect the recovered artefacts and determine their significance to the history of the region.